The WTO has to be reformed and updated, not discarded. And the EU should play its part, while at the same time promoting its own industrial growth. World Trade Organization headquarters in Geneva, Switzerland, April 12,2018. The WTO says that global trade is expected to remain strong, merchandise trade volume growing 4.4 percent in 2018, 4.0 percent in 2019. Xu Jinquan/ Press Association. All rights reserved.‘The WTO is unfair to US’. So tweeted Donald Trump on Friday, 6 April. The tweet followed his launch of a number of tariffs to protect US steel and aluminum, more or less direct threats to the EU, and further tariffs specifically targeting China. Is a global trade war about to begin? 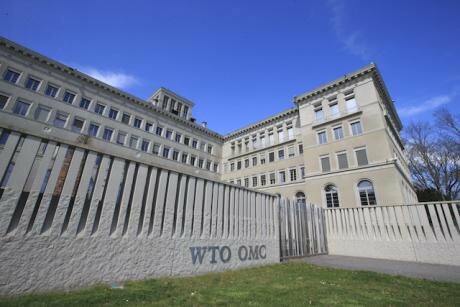 Has the WTO (founded in 1995, a true child of the global age) become pointless? In 1995 the EU had been one of the WTO’s main promoters, and not without reason. Even now, in spite of the protracted Eurozone crisis, the European Union remains the world’s biggest trade power (ahead of the USA and China), also because of its ‘single voice’ within the WTO, where it is represented by its member countries and as a single bloc. Foreign trade is a key asset of Germany (let us just think about cars, electronics and pharmaceuticals), the Netherlands, Italy, all in the world top ten of the countries with the biggest foreign surplus. In contrast, the US has the world’s biggest trade deficit. No wonder that Mr Trump wants to impose tariffs on foreign goods. For now, the EU has been exempted, but will this ‘privilege’ last? After all, Trump’s proposed duties have a rationale: the USA wants to re-build its own industry. Why doesn’t Europe think in similar terms? Industry creates high added value and the EU has lost a lot of industrial capacity and jobs, especially in the wake of the Eurozone debt crisis. Even in a former industrial power like France the share of employment in the secondary sector is now a meagre 24%. As of 2016, France produces about 2 million vehicles per year, slightly more than Thailand and almost twice the output of Italy, which lags behind the Czech Republic, Indonesia, and Iran, among others. In 1990 Italy was the world’s vehicle producer number five; now it struggles to stay in the top twenty. In technologically more ‘advanced’ sectors (e.g. software or IT) Europe is even less competitive. There is no European Facebook; no Amazon; none of the world’s leading search engines (Google, Baidu, Bing, Yandex, Yahoo!) is European. Why shouldn’t the EU then promote its own IT industry and maybe impose tariffs on the US one? Wouldn’t it be more interesting and rewarding to have a European (and maybe public) Facebook or Google? Otherwise, Europe will remain overly dependent on the USA. More autonomy is necessary, also in the relations with Russia or Iran, with which the EU has been too dependent on questionable US choices. Nevertheless, the world’s most important trade relationship is that between the USA and China. President Trump has imposed a first round of tariffs of $50 billion; China has retaliated (rather moderately) and the USA has threatened more tariffs. Is this the start of a real trade war or just a ‘performance’, an American attempt to start negotiations from a vantage point, in a typical Trumpesque style? After all, the USA needs China more than China needs the USA. China has massive trade relations with all continents, leads the BRICS group with its Development Bank and is the largest buyer of US public debt. Washington is not really in a position to unleash a trade war, while there can be some room for negotiation on more balanced trade relationships and sensitive topics such as intellectual property rights. Otherwise, a trade war could have a surprising twist, and help China and the EU become closer. More than China or the USA, the real loser of the dispute could be the WTO itself. Is the USA willing and ready to dispose of an organisation it contributed to funding? Perhaps. But China and the EU have benefited from freer trade and should continue, whatever Mr Trump’s new initiatives. Other emerging powers (including the BRICS) would probably follow. For all its flaws, the WTO did introduce elements of an ‘international rule of law’, which is embodied by that Dispute Settlement Body Mr Trump is currently boycotting by blocking the appointment of new judges. Destroying the WTO in the name of American nationalism is a road to nowhere. If anything, the WTO needs profound reforms, better rules on issues such as intellectual property and agricultural subsidies, and an update to a world in which distinctions between ‘developed’ and ‘developing’ countries are becoming blurred. After all, the US-China dispute is a strong sign that the age of US hegemony has ended. The international organisations promoted by the old ‘hegemon’ (the UN, NATO, the World Bank, etc.) are all being challenged and their very existence is questioned. China has put in place its own versions of the World Bank (the AIIB and the BRICS Development Bank) while Washington DC threatens to dispose of the WTO. All of this is particularly dangerous for a divided and export-dependent EU. The latter is an international body itself and should defend the cause of international organisations, while contributing to their improvement. EU agricultural subsidies, for example, represent a rent for EU farmers and a damage for poorer countries’ agriculture; it should be time to get rid of them. At the same time, the EU should reverse its process of de-industrialisation. Productive capitalism, if it is supported by innovation and a highly-skilled workforce, is an engine of growth and employment, and a guarantee of stability against the uncertainties of an uncontrolled financial capitalism. The EU needs a strong and shared industrial policy, which should also re-balance Germany’s dominant position. In fact Germany trades more with the Visegrad-4 countries, Poland, the Czech Republic, Slovakia, and Hungary, than with France – and mainly because of German companies’ delocalisations in those countries. In short, the WTO has to be reformed and updated, not discarded. And the EU should play its part, while at the same time promoting its own industrial growth. Shame that once more European politicians seem to be more focused on petty national issues than on the common European house.